Description of "School Science Projects Made Easy"
In this book you will learn the concepts and ideas for some wonderful Science Projects for learning science and also to use them as your School Science Project.This book teaches you How to prepare for Science Project, How to record observation and How to present your Project. http://ModelShop.in brings you the Science Education and hobby products that “Create Wonder and Inspiration" at affordable prices. We provide detailed instruction sets and science experiment log books to record observation with our products. We want to cultivate scientific temper by imparting scientific discipline of conducting science experiments and recording observations, And also to help parents & children to choose the appropriate scientific and hobby products in a convenient manner - so they need not go through the hundreds of available products for their learning needs. Also, some products are just not available in some cities. With the launch of ModelShop.in, all one has to do is log on to http://modelshop.in, select your needs and budget, and we will deliver the products right at your door-step. Children can also know more about the products they want to buy. We have created the Email buttons on every product page, so they can share the products with their parents or friends. We have hundreds of products on offer. All our products offer great value for money and are excellent for Education, with so much variety out there; our emphasis is to bring well supported products, which can make a difference to your child’s education. We have created shopping filters to search for your budget, hobby, purpose and age of child. Profits from the sales go towards our India initiatives. 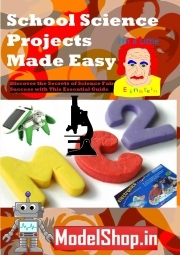 Reviews of "School Science Projects Made Easy"